An essential tool to understanding fire protection engineering. This valuable book draws on the author's long and varied experience in combustion technology and contains soundly-based engineering calculations in fire protection engineering based on start-of-the-art methods. This branch of engineering has evolved in order that knowledge in areas including chemistry, physics, structural engineering, mechanical engineering and statistics can be focused on fire safety. This is of especial importance in the operation of facilities such as airports, campuses and shopping malls and also in industrial settings where fire safety is vital due to the major benefits in terms of preservation of life and assets. The topics covered in the book have their basis in thermochemistry and heat transfer and examples covered are wide and include household fires, vehicular fires, extinguishments, calorimetry, evacuation of persons in a fire and detector systems. The contents of the book have an original slant with many new ideas. However, these have been adapted into calculations which are ideal for student use, requiring no additional mathematical skills beyond those expected of an engineering or physics student. 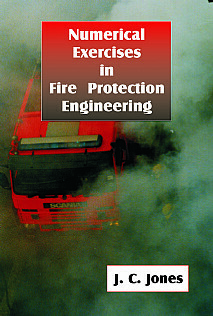 Each chapter has a short introduction followed by worked examples with information for the calculations being derived from international authoritative publications on fire protection engineering, resulting in a valuable teaching/learning tool. This extremely useful book will be of particular use to undergraduate or post-graduate students in fire protection engineering including thermochemistry and heat transfer. It will also be valuable in professional training colleges and in-service courses.